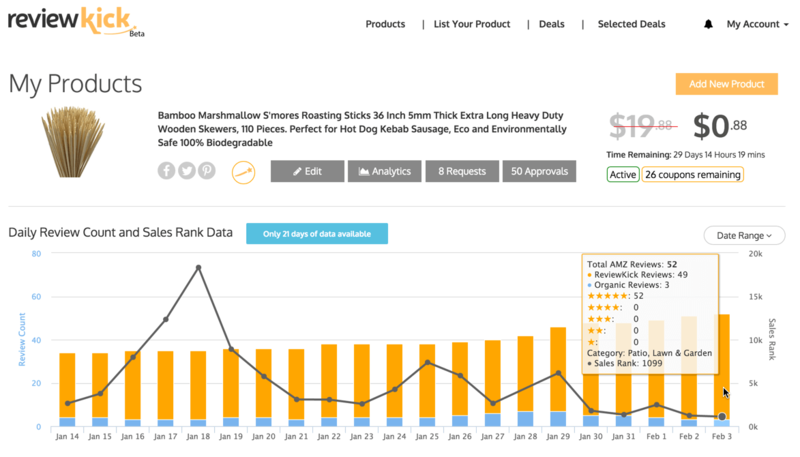 Jungle Stix is a collaborative product launch case study that demonstrates how to launch a private label product on Amazon. When I started this collaborative product launch with you guys, I wanted to share every aspect of launching and selling online with full transparency. Of course, I anticipated that would include various challenges along the way. Until now (can you hear me knocking on wood? ), we have had good experiences with our supplier. But now we’re seeing some increased competition with new sellers in the niche. Bring. It. On! What is the Jungle Stix case study? Jungle Stix: two months on Amazon. Our product went live on Amazon on December 7th. Since then, we have sold 471 units and $12,307 in sales in two months. Not bad! Regardless, we need to figure out what it cost to achieve this figure in sales. Sales/revenue vs. gross margin: what’s more important? People often get starry-eyed seeing a handsome six-figure number for Amazon sales. However, it’s the Gross Margin that is more relevant. Your gross margin is the amount of revenue you have left after you subtract direct costs such as ads, fees, and cost-of-goods-sold. My goal for any product that I sell on Amazon is to hit a 100% Return on Investment (ROI). In other words, for every dollar I put in, I would expect to receive a dollar coming out. What are fixed and upfront expenses? So let’s first review what the fixed and upfront expenses are. Fixed costs will be anything that does not change, no matter how many units are sold. For a typical business, this would include rent, salaries, insurance, etc. Fortunately, the beauty of Amazon’s business model means that we don’t have many of these costs to deal with. However, we did have upfront costs in order to get the product and listing active. The good news? We will not have to pay any of these costs again. Note: we did not actually have to pay all of these costs, like Product Photography, which was donated to us by Robert House. We were in China when receiving samples so actually got all of them for FREE, not even a penny for shipping 🙂 Our in house graphic designer did the design work. That being said, it is more instructive and realistic to include it as a normal expense as opposed to free. Next, are our Variable Costs, or those that change depending on how many units we sell. In a typical business, a variable cost may be hourly wages, material or ingredient costs, fuel for your car, etc. In our case, these variable costs include the cost of goods sold, shipping, Amazon fees, etc. Note – on order 2, our total shipping will be under $2000, we chose to expedite the first order so we could start our case study sooner. I calculated the “Product Giveaway” cost as $7.92 in Amazon Fees based off $27.99 retail price, plus the $7.02 cost per unit, minus the $1.99 that we “sold” it for on Review Kick. This means we spent $12.95 for each unit we gave away, multiplied by the 50 giveaways. I don’t plan to do any more giveaways for the first 1,000 units. This chart shows how our Review Analytics in Review Kick*. You can see that a majority of our reviews have come from the promotions that I have run on Review Kick, and we have some organic reviews as well (also all 5-star reviews, which makes my heart toasty like a s’more :-)). I think it’s interesting to see the BSR spike on 1/18/16 as a result of not having any inventory in stock, but you can see a very quick recovery and we are now at a BSR of #1099 in Patio, Lawn & Garden. *Update: Due to changes in Amazon’s Terms of Service addressing incentivized reviews, this method of utilizing promotions to get honest reviews is no longer allowed. Review Kick has now been relaunched within Jungle Scout, focusing on email communications to help Amazon sellers grow their business. You can still legitimately run promotions, which is a great way to increase sales velocity, but we do not allow any form of incentivized review. What are our total expenses? Now, it’s just a matter of adding all of this up. 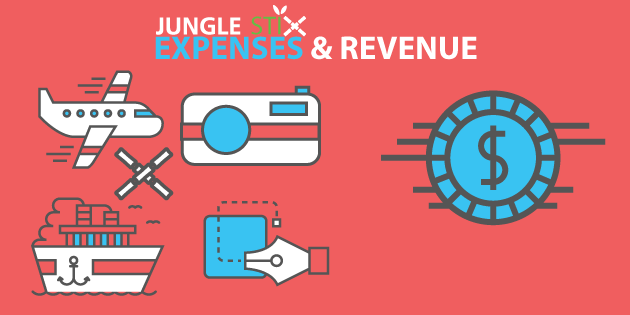 Before we get discouraged with the laundry list of expenses, let’s take a look at the revenues. The overall sales are a bit easier to calculate. We can simply take that from Amazon’s Seller Central Dashboard. How do you calculate gross margin for an Amazon FBA product? Our Gross Margin will simply be the difference between revenue and expenses. “Net Income” or “Profit” technically include other operating expenses and taxes. For simplicity’s sake, let’s just focus on the gross margin. What does all of this financial information mean? Long-story-short: we are off to a great start! We’ve just about recovered all of our initial investment and we still have over 500 units to sell. Remember: selling on Amazon is an opportunity that requires a long-term perspective. It’s about building a real and sustainable business. The gross margin analysis above combines upfront one-time expenses and promotional giveaway expenses, which I don’t plan to incur again along with variable expenses. Variable expenses will change according to the number of units that we sell. Additionally, we paid a premium on our shipping for our first 1,000 units. The only reason we did that was to launch faster for this case study. What if you save money by changing shipping methods? This reduction in cost will have significant ramifications on the profit margins, regardless of where we price the product. To understand the long-term outlook on this, I like to look at the per-unit breakdown, as our costs are significantly lower for the second 1000 after we incorporate a normalized shipping cost and amortize the upfront investment costs across more units. So the $1341 that we paid to get an optimized listing will now be spread over 2000 (or 3000 units) as opposed to 1000. In my advertising spend projections, I like to spread the advertising spend in each unit sold, whether advertising contributed to the sale or not. So for example, we have sold 471 units so far and spent $357 for all advertising. While Amazon attributes $1587 and $719 in sales (per campaign), I think it is easier to note that we have spent $357 in advertising for 471 units sold, or $0.76 per unit. I plan to maintain this spend going forward and can adjust this figure if conversion rates or CPC costs change. 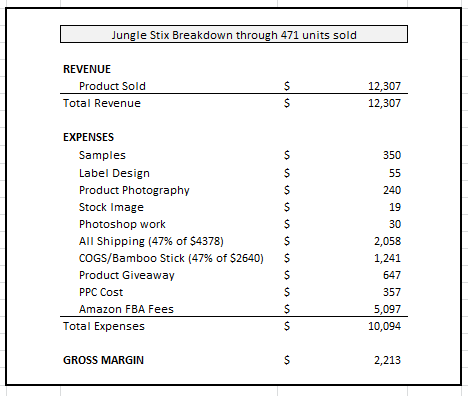 How did Jungle Stix come up with its pricing? As I mentioned earlier, we have started to see some new entrants in the “bamboo marshmallow sticks” niche. This was certainly expected and is the reason most people do not share which products they are selling. If you tell someone exactly what product you’re selling and how much money you’re making, you’re bound to have copycats. We have felt the impact of this and our average daily sales decreased. These competitors were selling at $20 per unit, so even though they had fewer reviews, they took potential customers away from us with competitive pricing. We were selling about 8 units per day before these competitors. But that has decreased to approximately 5-6 per day since. That’s why on 1/26 I changed the price to $19.99 to see how that would impact our sales and profits. Since changing our price to $19.99, we have seen sales nearly triple to roughly 18 units per day. But how would the new pricing structure change your profit margins? My goal with experimenting with pricing is to gauge how the units sell at different price points, and what the optimal price is that generates a maximum net margin and sales velocity. So we have seen that based on current seasonality and competition, we can sell about 8 units per day when priced at $27.99, we can sell 20 per day at $19.99, and if I split the difference at $23.99, let’s just assume that we will sell an average 14 per day. Looks like $23.99 might be the sweet spot for profits and sales velocity. Are Jungle Stix a success? Overall I think Jungle Stix are certainly a success. On the second shipment, it’s nice to see that even at the very low price of $19.99, we can still make a profit of $5.23/unit which is a 128% ROI. I imagine the sweet spot for this product is going to end up around $23.99 which would mean 213% ROI (and roughly $3,000-4,000 PROFIT/month). On another positive note, going into this, we knew that January through March would be our slow time, and we would see increased momentum as summer and fall approached. So that is good news. 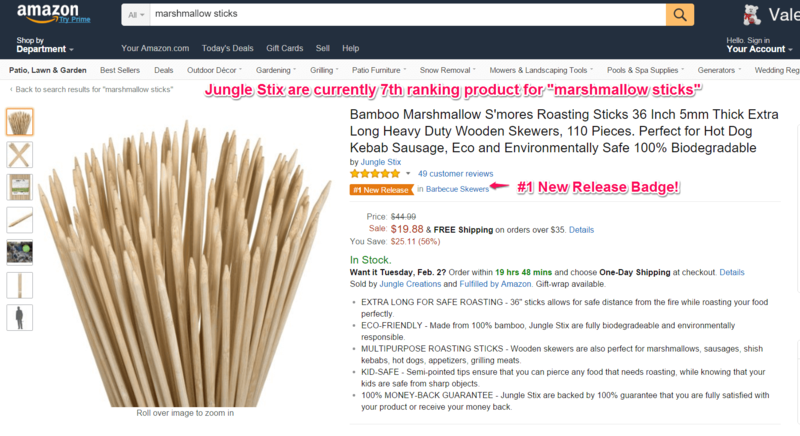 As our Jungle Stix sell more and we gather more reviews, we should see both an increased conversion rate (people more likely to buy a product with many reviews), as well as an improved organic ranking for various keywords (we are currently on the front page for our main targeted keyword, “marshmallow sticks”). What happens when you run out of products? In early January, we ran out of inventory! This was a result of the ocean freight shipment being held up at customs in Hong Kong for a few days, and delays in the States upon arrival. Argh, not ideal. However, I often see comments online about how this can be a momentum killer and plummet your hard-earned Best Seller Rank. While this may be true, depending on the strength of a listing and competitiveness of category, it is an inevitability at times with only so much you can do. We have ordered another 1000 units which will be manufactured and shipped via ocean freight. I would like to exceed our baseline goal of 10 units per day and see if we can push that up to 20 per day, as we have been doing while priced at $19.99. And I will keep an eye on the competition to see how they price as we move towards the summer months. As I’ve mentioned before, I am not keen on selling products on Amazon that become a race-to-the-bottom—there are never any winners in that situation! So stay tuned to see how this plays out, and please share any comments below. Using the Chrome Extension is a great way to gather product ideas from existing products on the Amazon marketplace. Sorry for this silly question. Actually the calculation say it’s totally 471 Units sold. But your first purchase is 1000 Units .Then how you got out of stock. Is it the Ocean freight of First Order ???. Then You had already some Units in your hand from your first order. Then What’s the Plan behind the Second Order so earlier. You really made my day, Wonderful B/D. My question, Most of the REVIEW platforms on Amazon had been cancelled, What do you suggest to the new sellers to generate Customer REVIEWS. One of the best ways you can get early reviews is through great customer service, having a great product, and using an automatic email follow up system. You might also try building an email list outside of Amazon. The Genius Series will cover some of these tactics in this week’s episode. Just a heads up, if you plug the ASIN into Amazon’s fee calculator the fees come out to about $10.32 (excluding 30 day storage fee), as opposed to the $9.92 shown here. Was that the effect of Amazon’s fee increase this year? It pulls the ROI down about 10% (or 13% if you include storage fee). Have you had to fundamentally change your strategy on any private label products due to the rate increase? For example, being forced to go with ocean freight in situations where you would have previously not needed to before the fee increase. Can you layout the formula you use for the 128% ROI calculation mentioned above? Trying to figure out what you are viewing as investment and what you are viewing as return. Thanks for the detailed breakdown. Can you please tell me that how much did you have to pay for custom duties? And what about custom broker and custom bond? Do you think you would go with retail stores in usa with jungle stix after this? Wonderful article you guys, thanks! The guy at DHL said we need an FDA approval letter to import a non-electric steel coffee pot. Is this true? Is this difficult to get? Do we go through the FDA or the supplier or both? Great article – really is fantastic! Where did you get the 6ft grey outline image of a person for your listing. I’ve been searching all over the internet and can’t find a source for these. Have you tried istockphoto, fotolio, or shutterstock? you should be able to come across something that can fit your needs there. Our graphic designed actually drew this for us. If you can’t find a stock photo, you can try hiring someone on Upwork to do it for you. You are right, it is a calculated risk and technically not within the ToS. However, we can replace the image easily if it does become an issue, and the benefit as that it makes the unique value proposition immediately apparent to a potential buyer, therefore increasing the likelihood of conversion. how does OEM work with the suppliers? Thanks! for sharing this awesome info.I am a wannabe seller. Do you have to register your company name in China, since you are doing business with suppliers from China? If yes, did you get a firm which was able to get contracts for you in Chinese? Who do you use for your pre production, production, and post production Quality control service? Glad that you are enjoying the info! -Greg did not register the company in China, in fact you do not have to have a legally formed company, you can be a sole proprietor as well. -Quality control was essentially getting many photos at different stages of the process, and receiving the first shipment to confirm that the quality standard was up to par. -There is no way necessarily to confirm a supplier vs. manufacturer with certainty without visiting, but if the numbers make sense, which it did for the Jungle Stix, and the relationship with the overseas supplier/manufacturer is built on a mutual trust, that can be sufficient to move forward. Great article, loved the breakdown and your plans moving forward. I had one question around your on-costs, particularly shipping. In the Gross Margin table, you put the shipping at 47% of cost, can I ask why, have I missed something here. We used 47% of the shipping costs in order to pro-rate the costs….at the time of writing, we have been through 47% of the first shipment (471 units out of 1000 that were initially purchased), so we wanted to have a true reflection of our costs to date, and not incorporate future costs if we were not incorporating future revenues as well. Does that make sense? Hope it helps! Hey Greg, many tanks for sharing this. I just have a question that probably can help just let me. When you ship to the US do you ship directly to Amazon or to a quality inspection company like FBA Inspection? I’m close to ship my first product and even if my supplier is reassuring me on this point, I would like to hear others opinions. Greg did an inspection of the initial shipment to confirm that the quality was the same as the sample. He did not use any quality inspection service though. Hi Greg – Great post! Shouldn’t you also take into account storage costs at amazon warehouses? Also, what about costs of returns/damaged units? The short-term storage costs at Amazon are accounted for in the FBA fees that were included as an expense, and you are correct too that returns should be included as an additional expense. We did not include that in these calculations, but it should be incorporated into the overall costs. Great point! Hey great case study. I wondered how you identified the sticks to be a good seller to start with? Did you use Jungle scout to see data on other people selling the same product? or did you create the product from scratch, with simply a hunch that it would work. From following your PPC campaign I learnt that you put a 100$ budget a night? I unfortunatly, chose a very competitive product for my first product. It has a very high demand too. My Breakeven ACOS is 40%. I put a 10$ a day budget, 0.75$ per click on an Auto Campaign, I receive about 25 clicks a day. I enable the campaign at 1 pm until 12 pm, and it sells 2-3 units/day. I tried increasing the daily budget but didn’t sell more…. My Auto campaign is getting out of budget every day and Amazon advices to increase budget to 17$ a day. What do you suggest? What is your ACOS on the conversions you are receiving? If it is under 40%, and 40% is in fact your breakeven point, than you would theoretically want to have an infinite budget if you are still profitable for any conversion less than 40%! It may be helpful to increase your budget to $17/day just for a few days, so that you aren’t missing out on any conversions, while also collecting significant keyword data that you can use to create a manual campaign that is more targeted and doesn’t allow Automatic targeting by Amazon, which may also include some bad traffic. Nicely done! You mentioned Variable Costs but the next heading said Fixed Costs. Was that a typo? So exciting to be following this progress. I’m trying to figure out packaging options on my end for my own import product. Is there a blog post or a resource you recommend for research these options? Thanks so much. Obviously it may not be directly applicable to what your product’s needs are, but seeing the images and his rationale may help! Were there any returns or refunds? If so, it would be nice to incorporate them into the numbers too as they do affect the bottom line. As more and more competitors are entering with the same product, what would be your game plan moving forward? Will there be a point where you would just drop the product because of over saturation? The $1341 for the optimized listing who do you use for this service? We didn’t use a service per se, for product photography, we used Robert House at http://www.productphotography.com, and graphic design we used our in-house designer, but that would just be a “service” you could find on http://www.upwork.com or use http://www.canva.com to design yourself. Thanks again. Looking forward to getting the spreadsheet from Gen and to your continued great posts! Can you provide any recommendations for Air Freights that will provide A thru Z service where they handle all the customs, duties and taxes for importing the good from China? Also on 1st shipment I will probably use a Courier to get the units to me faster. From your experience which courier is the cheapest out of UPS, Fedex and DHL. And do you have another other you would also recommend. UPS, DHL, TNT and Fedex are all air express companies that handle everything A – Z. It seems like DHL is usually the cheapest but just ask your factory to provide you quotes for each. Great stuff, Greg. Thanks so much for all the awesome value you’re providing. Just curious, looking back, is there anything you would have done differently or changed during any phase of this Collaborative Product launch? I feel like I’m on my way to a mini-MBA. Thanks for sharing. Question on shipping. I read an earlier post of yours (or Gen’s) that you could only ship max 500 units for oversize, yet you shipped 700 from your freight forwarder. I’m looking at an over-sized product and that has me concerned. I actually didn’t ship all 700 from my freight forwarder right away. I asked them to store 240 in their warehouse for a few weeks until I had some more room at Amazon. They charged me like $12 for this. Thanks Greg for Sharing. This is very informative. May I ask what ocean freight forwarder did you use? Greg, do you use only as your forwarder for ocean freight or do you use them as well for your air freight? Greg great work, ive been using JS since last month for amazon UK. One thing I’d say though is that JS does not need to be used for seeking out new products or niche products but also to search for products in a saturated category that require another product to make it work…i.e. those cheap ipod mp3 players (people still buy them, but I use this as an example), those devices need a larger memory and very often you need to buy an sdcard, so the key would be to bundle the mp3 player with an sdcard and you now have a new product. I entered a category similar to this in the UK where the price of the individual unit was 15.99GBP (no sd card) my offer went in at 19.99GBP and was an instant hit….page 1 no13 within 3 days. Total product cost was 8.45, amazon fees 3.50, profit 8.05 per unit. I also varied the price up to 24.99 and is still sell….now im almost out of stock and china has shut down…nightmare. JS predicted 500/month sales and guess what..its not far off. I am constantly on JS looking and love the product, so im rolling up my sleeves and looking forward to the next few products ive identified…..just waiting on china now. Canton in oct-nov is going to be very interesting. Sorry ive gone on and on but you don’t need a new product, sometimes just thinking outside the box and bundle can be the key. Thanks so much for all of the information!It is a great help to this newbie…please keep it coming! Will do! We’ll keep posting updates. Hi Greg, watching this collaborative product launch was a real eye opener right when I needed it. After feeling a little discouraged following a failed attempt to complete my first product purchase (after 5 months of working with a supplier), watching the various stages of the launch made it seem like a fairly simple process overall. Now I know there are many details to each step along the way which can make it feel like many little mountain to climb, but because of this product launch, I felt like I could give it another try and now I’m working on my “first” product again. Because of my first failed attempt this second time is going much faster because of all the things I learned the first time around. Thanks Greg for deciding to put this launch on for all of us to see. It inspired me to keep going. I’m a little confused on the shipping. Is this $942 what it cost for the 700 to ship from American port to Amazon? Sorry, we should have been more clear on that. The $942 was actually the total cost from UPS for us to mail the cases from either our house (where we got the first 300 sent) or from our freight forwarders location (where the 700 were sent). Greg, thank you for being so transparent with this case study. I think you touched on a crucial point for all the newbies out there- that, this is a long term model and not a get rich quick scheme. Putting in quality, means longevity in a highly competitive market. I’m excited to see the next update, because this just shows with good research comes good outcomes! Yep – that’s defiantly a key point! We’ll keep you updated. Thanks a lot Greg for this very detailed and interesting update on Jungle Stix! Could you tell us what freight forwarder you’re using for the 2nd shipment? Yep – we’re using Flexport. Beautiful breakdown, very thorough. Thank you so much for sharing Greg, always appreciated!
? Is your goal to establish junglestix as a brand and then later on figure out ways to get the ROI up?